There are lots of options for locating objects that are hidden, whether it be something you’re looking for or something you lost. Of course, most people think of a big clunky metal detector that hovers over the sand and beeps when it detects some type of metallic object. These still exist and can be used to find the general location of various lost objects, but there are other, smaller, more convenient options available. While pinpointer metal detectors are a fairly new gadget and were designed to be used alongside larger metal detectors, there are dozens of them already on the market. Each one is different from the next, and only a select few can really get the job done when it comes to tracking down valuable items. In this review we’re going to be taking a look at three different models of pinpointer metal detectors to see which one can really deliver. The design, features, effectiveness and durability are all key factors in each one of these devices, and we’ll be examining each one to give you a fully comprehensive view of which one might be best to help you on your hunt. 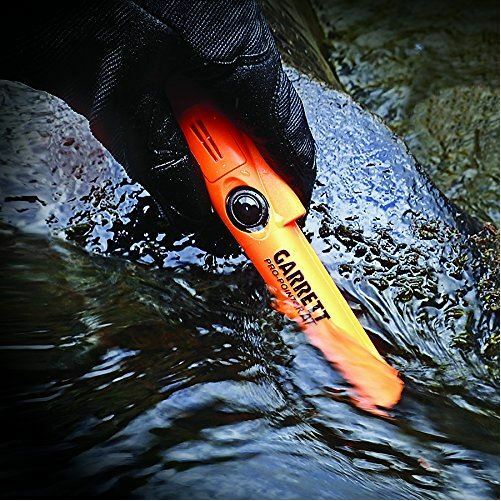 The Garrett Pro-Pointer AT has an outdoorsy, bright orange design that had us thinking that it looked more like a piece of hunting gear than a metal detector. It has a comfortable handle, a conveniently placed button, a belt holster, as well as the Garrett logo printed on the side in black. We loved that the handle had an 8-inch ruler engraved into the side. It’s a great place to put it, just in case there’s a need to measure the depth of shallow water or soil. We were pretty pleased with the color, because it makes the pointer incredibly easy to spot, especially in heavily-wooded areas. The shape was pretty intuitive, and as soon as we picked it up we had a pretty good idea of how it was meant to be used. The Garrett Pro-Pointer AT has some pretty impressive features. First and foremost it’s completely waterproof up to 10 feet. We found this to be an especially useful component, mainly because it opened the Garrett Pro-Pointer AT up to a variety of uses. You won’t want to take it scuba diving, but it’s certainly durable enough for wading on the shore while looking for a prize. The pinpointer also has three levels of sensitivity that are adjustable to your liking. We thought this was a great addition because it allows you to customize the pointer based on what it is you’re actually looking for. Depending on the size of the object, you can adjust the sensitivity for a more precise response. It also has a fast retune button, which narrows the environment and detection field if you think you might be close to the object you’re seeking. Lastly, there is a built-in LED light for low light situations. This was not only useful, but felt pretty essential, insofar as that it enables you to give yourself added clarity while using the pro-pointer even in places where the sun may not reach to provide light. It may not be bright enough to use at night, but during twilight this is a pretty awesome tool to have on board. 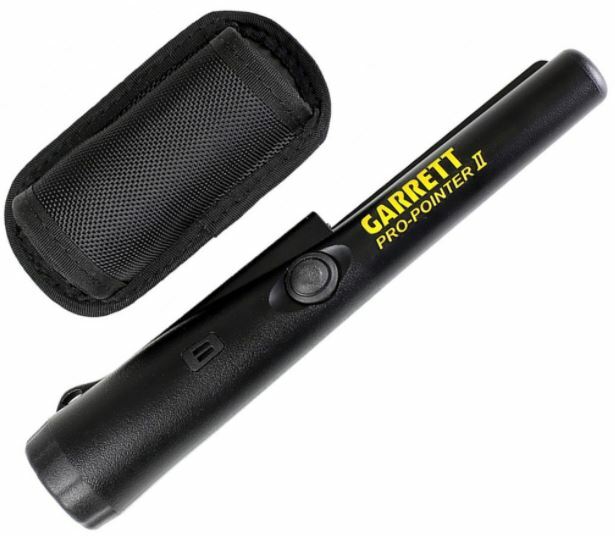 The Garrett Pro-Pointer AT is certainly the kind of device that does what it claims. We tested it out in water, sand and gravel and every time it was able to find the items we’d hidden. The sensitivity settings made it incredibly easy to find objects and narrow in on their location. The chirp alert was clear and let us know when we were approaching coins or other metallic items. While it was loud, it wasn’t a major disturbance, and we found it to be an appropriate alert sound for a device this size. 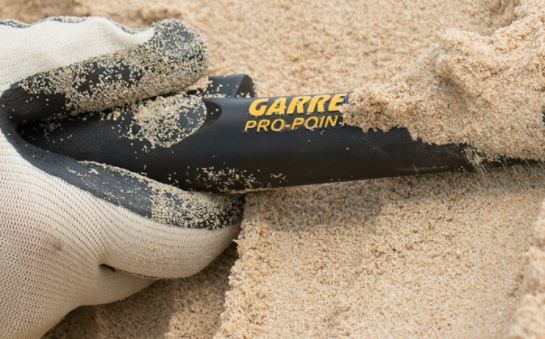 All in all, the Garrett Pro-Pointer AT definitely gets the job done. There wasn’t much we found particularly special about the design of the Garrett Pro-Pointer II. It’s shaped very similarly to the Garrett Pro-Pointer AT, except it’s a bit less impressive because of the all-black color scheme. In fact, the shape, combined with the color made it look a little menacing, almost like it could be mistaken for a weapon of some kind. It does have the same conveniently placed button as the Pro-Pointer as well as ergonomic shape, but its color scheme had us a little disappointed. Not only does it stand out less as a high-quality gadget, but the darker color makes it a lot harder to identify if you want to take it hiking or even to the beach. The Garrett Pro-Pointer II is designed mostly for beginners, and as a result is fairly light on features. Unlike its brother the Garrett Pro-Pointer AT, it isn’t waterproof. This was a major downside, mainly because it limited the device in what it could do. It might be useful for finding things in the sand at the beach, but you won’t be able to walk into the ocean with it without it getting damaged. It does have pinpoint tip detection, a vibration and sound alert, as well as a 360* side scan capability and scraping blade. When it comes to dry surfaces, the Pro-Pointer II can certainly get the job done, and is suitable enough for finding small items, but it isn’t nearly as impressive as the waterproof Garrett Pro-Pointer AT. That being said, it does come at a lower price point and, in that regard, was appropriately equipped. 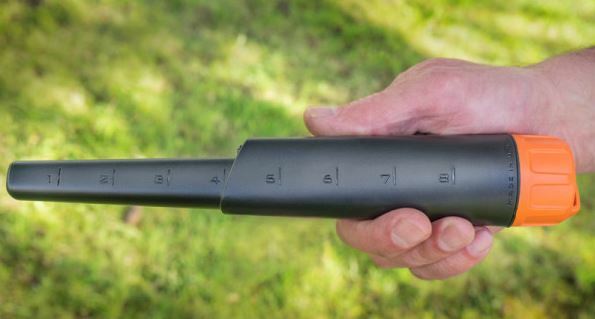 The Pro-Pointer II is an effective metal detector, but is limited by its lack of waterproof capabilities. It’s extremely sensitive, and the vibration and sound alerts do react quickly in the presence of things like coins or jewelry. For the beginner, or someone just looking for a gadget to take to the beach for fun, it certainly can do the job. It just isn’t as versatile as some other similar pinpoint detectors on the market. You’ll also want to use it in conjunction with a more heavy-duty, powerful metal detector for added accuracy and a wider field of detection. Unlike the Pro-Pointer AT, its sensitivity settings are not adjustable, making it difficult to know if you’re covering a wide area. The TRX Bulls-Eye PinPointer from White’s has an outdoorsy, huntsman-style look, with a comfortable handle and unique color scheme. 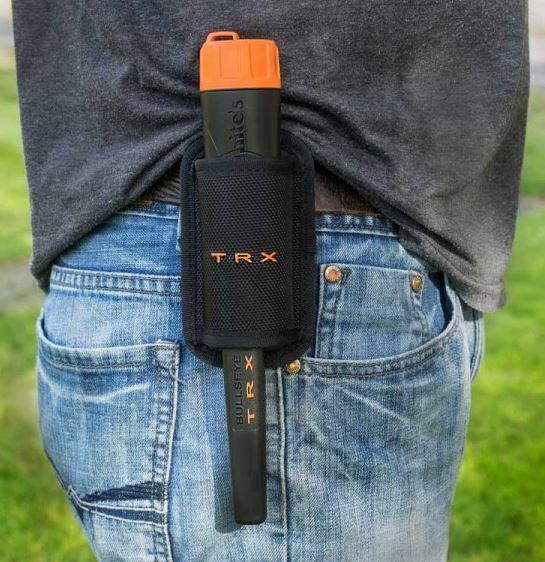 The majority of the device is black, with some orange accents to make it easily visible while using it in your backyard or while hiking. It has a similar shape to both Garrett pinpoint detectors: a large handle, with a smaller pointer that is designed to hone in on small trinkets. It’s worth mentioning that the shell didn’t feel as durable or sturdy as some other models, but White’s does allow for it be replaced if need be. It also has the White’s logo printed on the pointer along with the model for a little added style. Holding it felt fairly intuitive as did the other pinpoint detectors on our list, and the button was conveniently placed on the handle. In general we liked the design, but thought there was one thing missing. We would have liked for the TRX Bulls-Eye to have a loop on the end so that it could be easily carried in a belt-loop or even on a sturdy keyring. As it stands right now, the pin-pointer has to be held at all times, or put into the included belt holster. The TRX Bulls-Eye PinPointer isn’t particularly impressive when it comes to features. It’s billed as being an “automatic” pinpoint detector that doesn’t require any calibration, but with other devices on the market that offer such sensitivity customization, we saw this as more of a negative than a positive. It does have a built-in LED light that turns on when the button is pushed, and can last up to 20 hours on either two AA batteries or one 9V battery. Furthermore, it’s waterproof with an IP68 rating. An IP68 rating means that the device is waterproof up to 1 meter for a total of thirty minutes. This was one of the best parts of the device, mainly because it made up for the lack of customization of its settings. Being able to use this pinpointer underwater for such a long time added a level of versatility to it, even though we couldn’t adjust its sensitivity or field of detection. 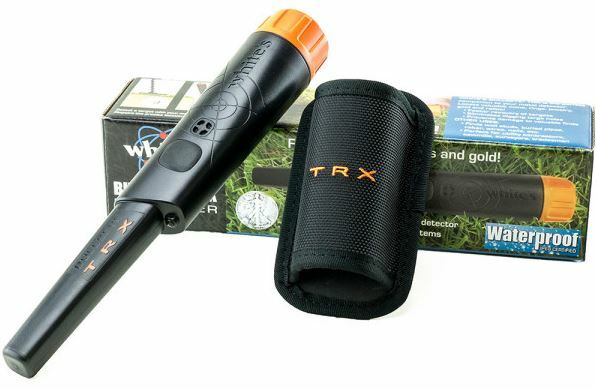 The TRX Bulls-Eye PinPointer is fairly effective, but you’ll almost definitely need to use it with a more powerful metal detector to get a solid result. It begins to respond to a metal item within about ten inches, which is acceptable, but you’ll first need to locate the general vicinity of the buried coin or nugget that you’re looking for. 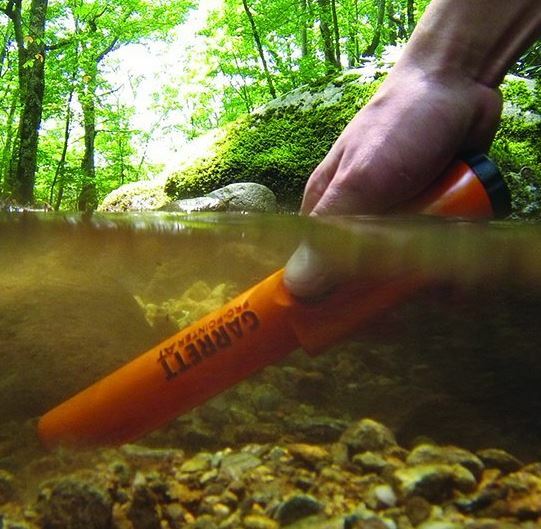 In general, most pinpoint detectors function this way, but for underwater use we would have liked for it to be a little bit more powerful since lugging a metal detector over a stream or the shore of the ocean seems a bit impractical. Still, it responded to coins, jewelry as well as other small metal objects with relative ease, as long as we were already close. Most of the detection takes place in the tip rather than in the entire device, which did add a slightly higher level of precision to its ability to track items. After testing out all three pinpointers, it was pretty clear that the Garrett Pro-Pointer AT gets the gold. It had the most valuable features, was the easiest to customize and had the most practical, useful design. What really made the Pro-Pointer AT stand out among the TRX Bulls-Eye and the Garrett Pro-Pointer II was its built-in, adjustable sensitivity settings. While most pinpointers are designed for use with larger, more powerful metal detectors to maximize success, we felt that the Pro-Pointer AT was still powerful enough to cover a wide area on its own if necessary. It wasn’t a standalone device by any means, but had the most power of all three we tested. By creating the option to modify the sensitivity as well as the radius, we didn’t really see how you could lose by selecting the Pro-Pointer AT. While the other two were effective, they just weren’t as precise and only seemed to work within a very close range to the hidden object. Also, the bright orange color scheme seemed like it should be a given for any gadget like this. Considering that a pinpointer is the kind of device that you’ll want to take outdoors with you on long walks or hikes, giving it a bright, easily-to-spot color made it stand out both visually and practically among the competitors. It was even priced lower than the White’s TRX Bullseye, despite being loaded with more features. The other two pinpointers on our list are still quality products that are worth a look, but between the three, the Pro-Pointer AT is certainly at the top when it came to a variety of factors. It was accurate, practical, effective and seemed made for just about any kind of terrain. The TRX has 4 sensitivity settings. I run mine on 3. You can also choose between tone & vibrate, tone only, or vibrate only.